This is the text of the talk given by Dr. Keki Mistry, a dentist from Mumbai and a long time devotee of Bhagawan Baba, in the Divine Presence on the occasion of Christmas in 2004. Fellow pilgrims, in the year 2000, the Para Olympics were held in Ireland. The Para Olympics for kids is an Olympics for specially advantaged children - differently advantaged children. The 100 metres mixed race was on. There were 10 lanes with 4 girls and 6 boys, each representing their country. The gun went off and everyone started. While they were in different positions on the track, suddenly there was a noise and the runner in the middle lane fell down. The amazing thing that happened was that everyone stopped! Each of the 9 other contestants stopped, turned around and all went to the boy who had fallen down. One of them picked him up, another one dusted his clothes and a girl gave him a small kiss on the cheek and said "That should make you alright". Then they all linked hands and went towards the finish line together. And remember this was at the Olympics. There were 45,000 people in that stadium who all stood up and clapped for 15 minutes - there was not a dry eye in the audience. Why? These specially advantaged people showed us the meaning of Sai's message. They bonded together in love and went towards the goal together. In the May issue of Sanathana Sarathi, 1998, Baba says that we must treat God as an old friend, and we should not put any distance between Him and us. If you treat Him as an old friend you will respect Him, you will love Him, and there will be mutual understanding. 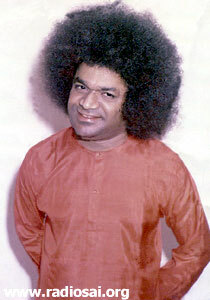 Bhagavan Baba says you have a lot of respect for a new friend, but still there is a little distance. An old friend is somebody who with whom you naturally get along with. 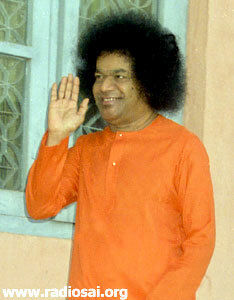 Bhagavan Baba says treat the Lord as an old friend. I think there can be no greater message for us. In the early days Bhagavan Baba told us 'Appreciate and take in all that I am giving you, because towards the end of My life on earth, I will be less mobile and you will be less able to approach Me.' We thought that You would be surrounded by crowds - which You are. But little did we know that You were giving us the final message – 'Do not be attached to the body-form, the body-form changes, but the message, the message is constant.' Pay attention to that constant message even now. "He Is Not Your Son…No Cancer." Talking of limitations of movement my mind goes back to a personal experience. In 1965, I developed a very bad cough, so bad that I could hardly speak. I could not sleep flat on the bed and I had to spend the nights either sitting down or raised on many pillows. I had myself medically checked and they found a tumour the size of a golf ball in the area between the nose and the throat, very close to the brain. I was only 5 years into my dental practice and I was doing fairly well. If I had not been able to communicate it would have destroyed my career. Bhagavan called me - how He did that is a different story for another day - and I went to Him with my mother. He sent for my mother saying 'Your mother is not well, bring her along'. Well, one look at my mother and you could tell that she was a sufferer of asthma. There were 200 other people waiting, all suffering in different ways and we were called in 4th. I and my mother went inside and Baba started to talk to my mother, telling her about her asthma, but mother was not concerned about herself. She finally asked the million dollar question, 'Baba is it cancer?' Baba said 'He is not your son. He has come only through you. No cancer.' He then waved His hand and then took out lot of ash and gave it to her. This was her very first visit, but she got down on her knees to receive it. Believe me, my dear brothers and sisters, my symptoms disappeared and I could speak normally. I was very nervous thinking that this 'cure' was maybe a trick of my mind. So I did not go to any doctors to verify this possibility. I was a fully checked cancer case, with full records from an ENT surgeon, a cancer specialist and one of Bombay 's leading surgeons. Six months passed and I was perfectly alright. But the mind plays monkey tricks and I did not get myself checked - I was afraid that the cure was not real. One morning I suddenly got up and began to have a coughing fit and I spat out lots of blood. I was extremely nervous and went running to the ENT Surgeon who had seen me earlier - a good friend of mine staying within a stone's throw of my house. I asked him to examine me. He gave me a local anaesthetic and on investigation reported that 'There is nothing there'. I was stunned. 'There is not even a trace of tumour there' he continued. This gave me all the confirmation that I needed.This is a documented case and I am here speaking to you now because of the grace of Bhagavan Baba! Puttaparthi was a small dot on the map of Anantapur. It was a cluster of huts in a dusty village. The ladies had to go to the Chitravathi River for water and the river bed was often dry. A child had to walk 9 miles to go to school; there was no medical aid to speak for 40 miles around; and to reach the village the last 3 miles had to be covered by bullock cart. 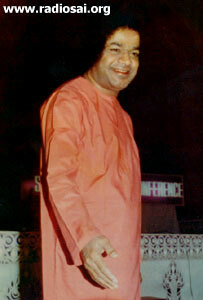 Today Prashanti Nilayam is the hub and centre of the spiritual world. A University worthy of any university is here and an educational institute where everything is available from KG to Ph.D. A beautiful Hospital giving free medical services as only as Swami can manage, and now Prashanti Nilayam can be reached by many roots - air, road and rail. Bhagavan was once telling the students, 'Be involved with life, I do not want you to treat life as a tiny flickering flame of a candle; rather as blazing flame to be held for a while and then to be passed on as a roaring fire.' This roaring fire is that of enlightment, of knowledge, of full realisation. Sometimes people ask 'How do you propose to change the world?' The answer to that question is, 'Why do you wish to change the world? Change yourself and there will be one more whole human being in this world.' Today on this holy day dedicated to that Master of Love, who has spread this message of love, is it not important to re-emphasize this message of love which has been the ancient message of Christ and the teachers of India for so long. Wanha dil ka lagaana kisko aatha hai? 'This is the world; but who really knows how to share his heart? When today on Christmas Day, Bhagavan has blessed this individual on my 70th birthday to speak before you, it seems like a miracle. I am really grateful for all that You have done in my life to change it and I hope and pray that You continue to shower all Your blessings. In fact, Your blessings are always there on each one of us! It is for us to tune ourselves to receive those blessings Bhagavan.